On the eve of the release of Superman Returns, I've decided to try out a little Super Snack. 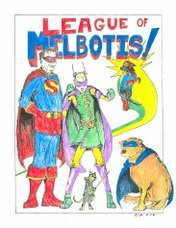 Better living through League of Melbotis. It's Cap'n Crunch! Now, with real Superman Shield Shapes! Jeff approves. You can see for yourself the shiny, pretty Cap'n Crunch Box. You can almost begin to imagine my anticipation. Note: It promises to turn my milk blue. Superman wouldn't steer you wrong! See, free entertainment. Jeff and I have a game scheduled for Thursday evening. Superman, ahoy! Lookie there. Those are some Super Shields mixed in with the usual Crunch barrels. I confess, I love me some Cap'n Crunch. I'm kind of excited. For scale, here is an example of a Crunch Shield. Note the color. It is red. Sort of. Wha..? As advertised, the cereal turns the milk blue. Some of the shields get a little blue or purple, but... but... there's some serious mad science going on here. I'm a litle scared. Skeptical. Simply skeptical of blue milk. It smells like The Cap'n. Sweet. Crunchy. Delicious. I am reluctant to take my first bite. Not dissimilar to my usual bowl of The Cap'n. Not dissimilar at ALL. I believe I WILL have another bite. Yowzah! Now that is some cereal. SWEEEEEEEET!!!! You'll have to pardon this photo. I'm on a sort of diet. Not much sugar lately. ARGHHH!!! Crunch scrape. Must slow Crunch eating to a crawl. Yes, this is a truly Super addition to my Super diet. The League fully endorses this product. Next up, some Super 4-Cheese pasta.